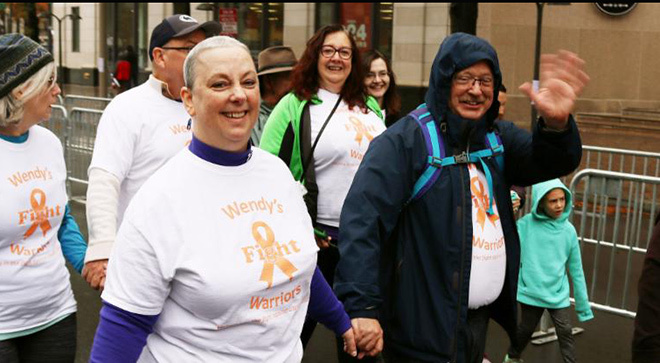 When Wendy Ericsson learned she had uterine cancer in December 2012 she went looking for information, but didn't find much out there about her disease. Through her doctor, she was directed to the Foundation for Women's Cancer (FWC). Initially diagnosed with irritable bowel syndrome – a result of her tumor being wrapped around her colon - an annual visit to her gynecologist revealed a much dire diagnosis: stage 4b uterine cancer. Ericsson had surgery, followed by chemotherapy. She was cancer-free for three years. In March 2016, the cancer came back, and then back again in early 2017. She obtained a second opinion, which resulted in a diagnosis of fallopian tube cancer. Since this is treated the same way as ovarian cancer, it opened more options for treatment. That’s when Ericsson considered participating in a clinical trial, which consisted of more chemotherapy, since she wasn’t selected to receive the experimental drug, but at a different dosage and frequency. She spent most of her summer in and out of chemotherapy treatments, until she experienced some blurry vision, a side effect that her oncologist had never seen with this treatment before. She ended treatment after 15 weeks and regained her visual acuity. Although she had to end her participation in a clinical trial, Ericsson understands the important role they play in finding out which treatments work, how well they work and what dosage works best. In recent years, though, there has been a reduction in the number of women with gynecologic cancers, such as ovarian, cervical, vulvar, vaginal and endometrial cancers, who are enrolled in clinical trials. In fact, phase 3 trial patient enrollment has seen a 90 percent reduction, according to the FWC. The number of gynecologic cancer clinical trials has also seen a decline. “National Cancer Institute (NCI)-sponsored trials went from almost 60 to six from 2014 to now,” said FWC president David Mutch, M.D., of Washington University School of Medicine in St. Louis, Missouri. Clinical trials are the final, critical step in developing new therapies that provide women with cutting-edge care, with the focus of improving survival. For example, a study published in 2007 found that adding chemotherapy to radiation therapy when treating cervical cancer significantly improved survival, which is now the standard of care, said Laurel Rice, M.D., of UW School of Medicine and Public Health in Madison, Wisconsin, and president of the Society of Gynecologic Oncology. The decline in the availability of clinical trials is attributed to many factors, including a limited National Institutes of Health budget, restructuring of NCI-sponsored cooperative groups and a shifting emphasis on smaller biomarker-driven studies, according to leading experts in the field. Mutch explained that the larger clinical trials will now be taken on through the Gynecologic Oncology Group (GOG) Foundation, which is headed by Larry Copeland, M.D. Many of these trials will be funded by the pharmaceutical industry with a strong commitment to drug development. Mutch, Rice and Ericsson agree that one of the best ways to solve the clinical trial crisis is through education and advocacy. To help spread the word, the FWC has lobbied patients to speak up to government leaders about the inadequate number of clinical trials available to them. The organization also is developing a website that will list all gynecologic oncology clinical trials with the GOG Foundation working toward supporting this effort. Ericsson found out that her cancer came back for a fourth time just before the new year. She will begin treatment with the new PARP inhibitor Zejula (niraparib), as she continues to raise money for research and spread awareness around clinical trials.